Iain Percy, another Olympic Champion, was on board Oman to call tactics, but today he was just enjoying the ride. 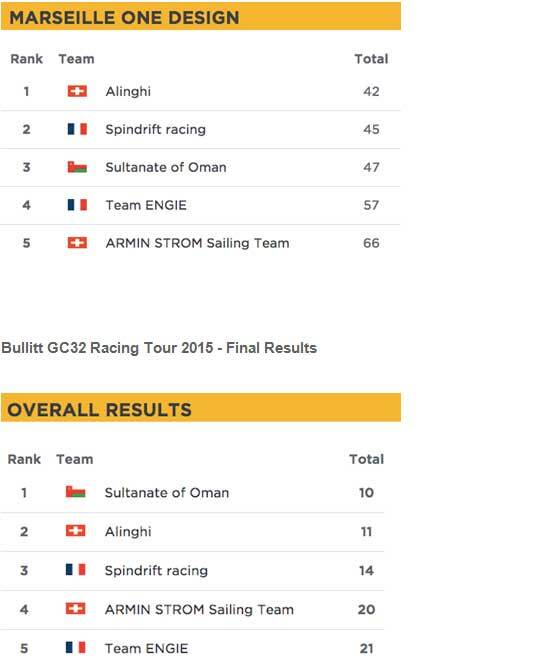 "That was a lot of fun, an absolute blast, and we're pleased we managed to help Leigh [McMillan] and Sultanate of Oman win the Bullitt GC32 Racing Tour this season. It's been a good learning curve for us and we've gained a lot from our time racing the boat here in Marseille." 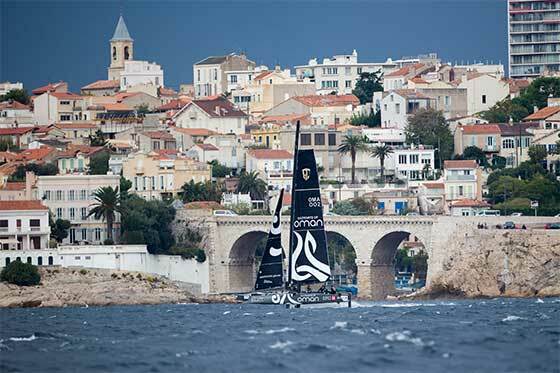 After the light winds of the previous day, Morgan Larson was steeling himself for battle with Spindrift racing and Oman, both of whom were close enough on points to take Marseille victory away from the Swiss team. "It's a pity we didn't get any racing today but we learned a lot from watching those boys on Oman blasting around," said the American, who took a more gentle approach to the waiting game on the water. "A while back I thought foiling was a bit of a fad, but clearly it's here to stay. It's awesome, we're learning more every day, and it's been a great season for the GC32 class." While Oman was doing the most blasting around the bay today, Team ENGIE had her moments, even flying the Code 0 gennaker downwind. Asked what was his best moment of the 2015 season, Spindrift skipper Yann Guichard replied: "Today! We had some incredible moments sailing just now, and we managed 37.5 knots at one point. Coming 3rd overall for the season, it has been a good season for Spindrift and we're looking forward to more next year." Skipper of ARMIN STROM Sailing Team, Flavio Marazzi makes no secret of his preference for stronger wind sailing, and was the winner of the Cowes Cup earlier this summer, the last time that the fleet raced in strong winds. "It's the strong winds where the boats really come into their own," said Marazzi, also the Class President of the GC32. "For next year we are getting a lot of interest, and we could be looking at eight to ten boats on the circuit next year." 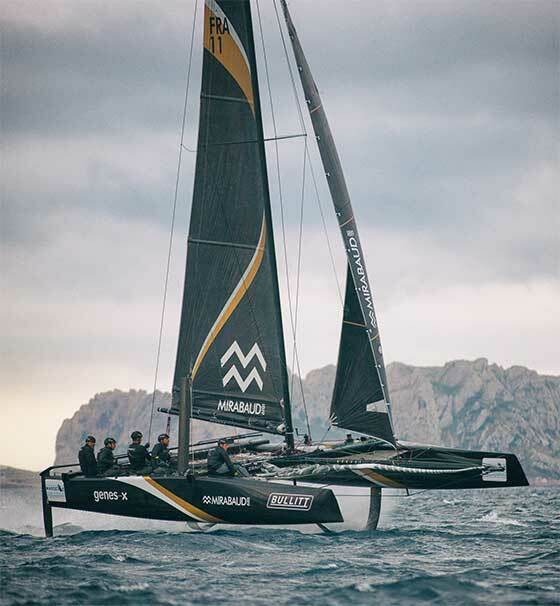 The GC32 is a 10m long (12m including bowsprit) by 6m wide foiling catamaran conceived by Laurent Lenne. Her hulls and foils were designed by Dr Martin Fischer, previously a leading F18 catamaran designer with his Capricorn, Hobie Wildcat and Phantom F18 designs and who was part of the design teams behind the Groupama ORMA 60, maxi-trimaran, VO70s and Groupama C C-Class catamaran. Until recently he was a designer with the Italian Luna Rossa America's Cup Challenge. With structural engineering carried out by Brett Ellis (ex-Alinghi/Luna Rossa), the boat is built in carbon fibre throughout by Premier Composite Technology in Dubai, builder of the Carkeek 40HP, 47HP and 60 and the Farr 400. 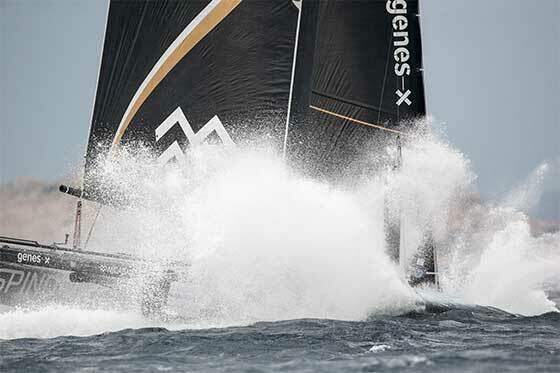 The foils are manufactured by Heol Composites in France: The GC32 features T-foil rudders and J-shaped daggerboards/foils, similar in concept to those used on the AC72 America's Cup catamarans. However relative to the size of the boat, the foils are substantially larger, allowing the GC32 to foil even in low wind speeds and with much great stability and ease. Despite having big foils, the GC32 has already recorded a top speed of 37.9 knots. Unlike the AC catamarans the boat features a more manageable soft-sail rig with one design sails from North Sails France, carbon fibre spars from Southern Spars and composite standing rigging from Easyrigging. The boat is demountable with a two piece mast for easy transportation. Founded in 2009 by Colin Batt, David Floyd and Richard Wharton, the Bullitt Group designs, manufactures, markets and sells consumer electronic devices in partnership with global brands. It is the worldwide licensee of Caterpillar Inc. for ‘rugged' mobile devices and accessories, Kodak for easy-to-use smartphones and connected devices and Ministry of Sound and Ted Baker for audio products. Based in Reading, UK, Bullitt's products are sold in more than 60 countries and the company has a presence in key markets across the globe including Taiwan, Taipei, the UK and the USA. Bullitt Group has a simple yet clever business model. It works with well-established, global brands to develop, manufacture and sell much-needed products to under-served market areas. Understanding and applying the DNA of those brands is fundamental to Bullitt's approach. The relationship between Bullitt and each brand is built on a deep trust and a strong desire by both parties to remain true to the brand values.